Apple may have announced support for iOS 6 on the three year old iPhone 3GS and the two year old iPhone 4 but they won’t be getting the same treatment as the company’s newest iPhone 4S. If you go through Apple’s website and read the fine print you will find out that some of the more important features in iOS 6 that were demoed in the keynote couple of days ago won’t be available at all on the iPhone 4 and 3GS. 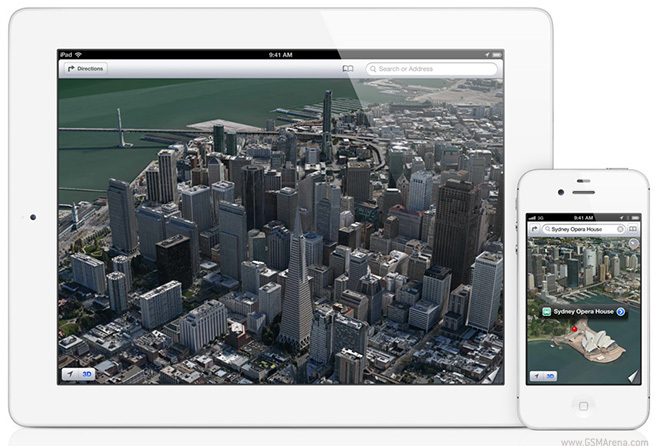 One of these features is Flyover, part of the new Maps app in iOS 6. Flyover lets you see an aerial view of the major metro areas around the world in glorious photorealistic 3D. As you can imagine, rendering all that detail would require quite a lot of horsepower and as such only the iPhone 4S, iPad 2 and the new iPad will support this feature. The other feature is turn-by-turn navigation. Unlike with the Flyover, however, there is no apparent reason why this feature would not be available on the iPhone 4 and 3GS as third party apps have been doing it for quite a while now. As you can see, Apple is intent on keeping its best features on its newest devices, whether for technical reasons or for something else. Still, compared to what people on other platforms are used to, iPhone users should be happy that they are getting updates at all, even after three years.